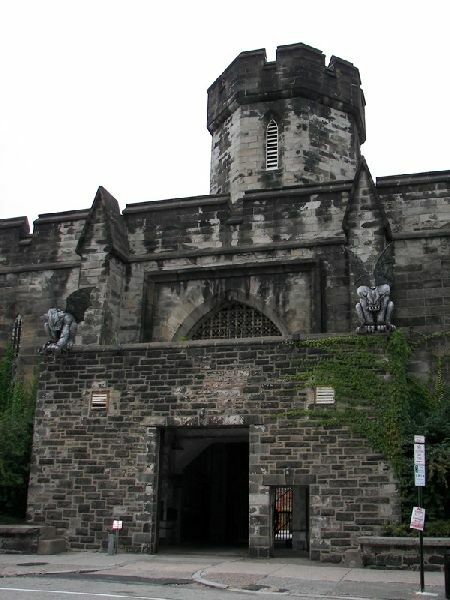 In the Fairmount section of Philadelphia, located at Twenty First Street and Fairmount Avenue sits Eastern State Penitentiary, one of the most foreboding, gloomy and sinister looking structures on earth. Its designer and architect, John Haviland who with the erection of EASTERN STATE became the foremost authority on prison construction, was a major influence on the building of over 300 penal facilities worldwide. NO, THIS IS NOT A MEDIEVAL CASTLE. IT IS A PRISON! Its basic design was known as the “Radial Plan,” which was and still is a fairly simple and secure design that offered both isolation for individual inmates, but at the same time each wing could house a large number of confined prisoners. Essentially, if viewed from above, the interior of the penitentiary resembled a huge bicycle wheel, with the center control being the hub and each of the housing wings a spoke. The design provided those manning the central control an extended line of sight down the long corridors of locked cells. 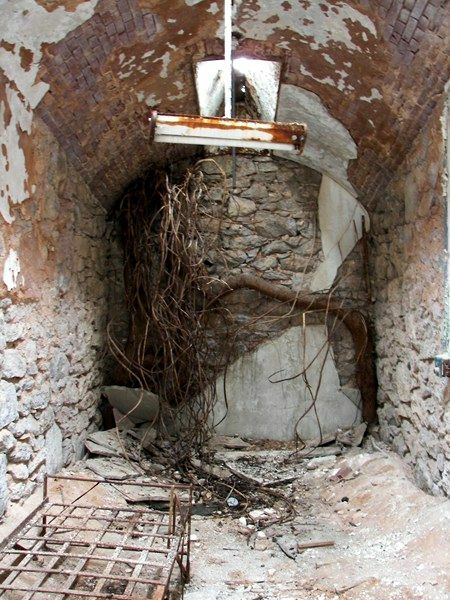 EASTERN STATE PENITENTIARY was the first of its kind, but certainly not the last. In fact, the construction of Trenton State Prison, another of Haviland’s projects, began shortly after the completion of EASTERN STATE. 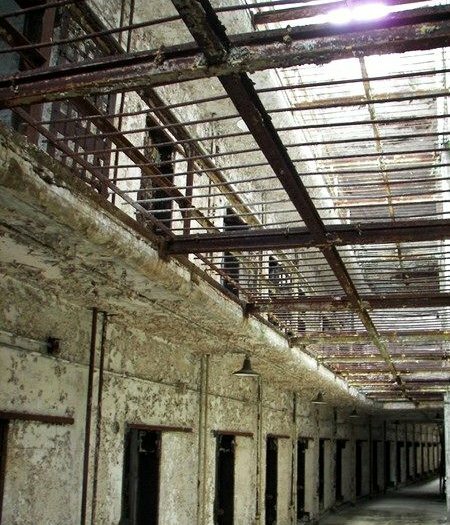 Unlike the Philadelphia facility which closed in 1971, Trenton State still houses men in cells that were built in 1833. Not only is this hard to imagine, but one cell now houses up to four inmates, all of whom are serving a life term or more. Men spend decades of their sentences in these extremely harsh surroundings. 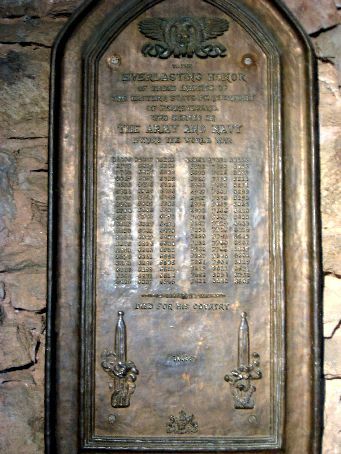 AN HONOR ROLL IS ON DISPLAY WHICH ACKNOWLEDGES PRISONERS OF EASTERN STATE WHO DIED FOR THEIR COUNTRY DURING WORLD WAR ONE. 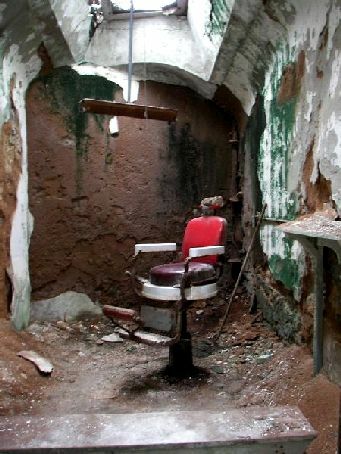 THEY ARE LISTED BY THEIR INMATE NUMBERS AND NOT THEIR NAMES; A BARBER CHAIR IN WHICH INMATES AND GUARDS ALIKE RECEIVED A TRIM; AND CELL BLOCK FOUR. 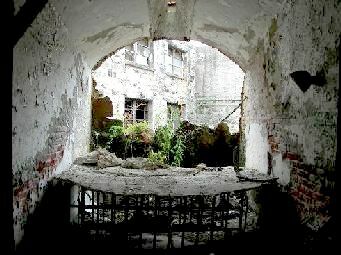 A RUIN OF A FORMER CELL; STANDARD ACCOMMODATIONS; AND THE ELEGANT, EXPOSED INFRASTRUCTURE OF A COMPOUND ARCHWAY BY JOHN HAVILAND. In all of Haviland’s designs, although created to foster rehabilitation, the reality was harshness, desolation and an ineffective method of incarceration. The early penal philosophy, which was wrongly attributed to the Quakers, was that separation, silence and penitence would somehow be curative. Not surprisingly these practices led many prisoners to madness and cured nothing. There was also the prevailing theory that if the prison environment was sufficiently menacing and inhospitable, no soul would ever wish to end up there. Interestingly enough, many of the great intellectuals of the eighteenth and early nineteenth century, including Dr. Benjamin Rush and even Ben Franklin, struggled greatly with the difficult issues of criminality, mental illness and how to treat those human beings that were not considered to be “normal.” In much of the early prison doctrine, there was indeed a heavy emphasis on isolation and atonement. 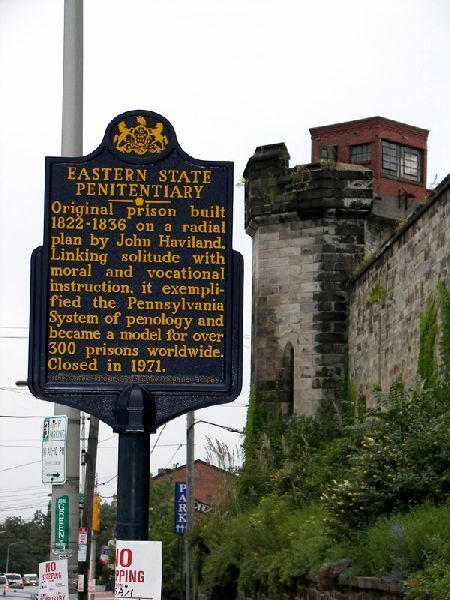 So when EASTERN STATE was created, its purpose was to not only to segregate society’s outcasts, but to also rehabilitate them. Prisoners were separated from each other at all costs, not because it was believed that they would harm each other, but so that they would not establish relationships that would extend beyond their period of incarceration. It was thought that this practice would encourage good behavior and better serve to protect the community from future criminal activity. As criminals were obviously not voluntarily sitting in waiting room furniture to inhabit the place, they were not slowing their crimes either. 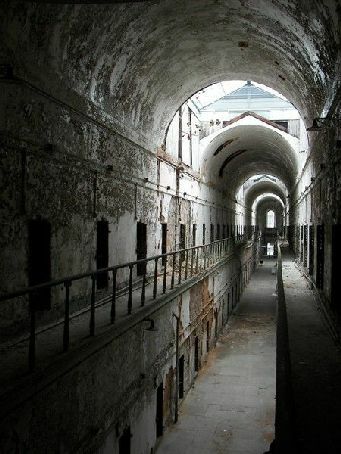 During a recent personal tour of EASTERN STATE conducted by our very gracious and knowledgeable guide Jessie Sarnoff we spent time in a number of areas that are popular with the thousands of people that visit the prison each year: the rotunda, the exercise yard, death row and the cells that housed Al Capone and Willie Sutton. As we walked its echoing dark corridors we talked about the notorious escapes from the fortress and the history of riots including the one in 1961 ¾ when in corrections parlance “we lost the jail,” which is when the prisoners actually take over the facility and it has to be taken back by force (Attica would later become an infamous example of this). I was equally fascinated by the condition of the building. 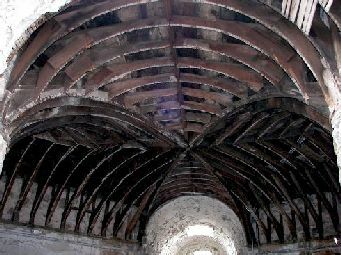 During the period of its closure from 1971 through the early 1990’s, nature had begun to reclaim the decaying structure. The sight of tree roots growing through the crumbling cell walls gives a Gothic horror feel to this already eerie and unnerving place. As someone who has spent a good number of years working in corrections, including a stint at the legendary Trenton State Prison as a New Jersey Parole Board Hearing Officer, my interest was piqued by the less well known facts and stories that are always found in the prison environment. Not all was as bad as it seems at EASTERN. One story was that some of the veteran guards would come in on the weekends to have the inmate barbers cut their hair. Not all that unusual, but some accounts indicate that the guards brought their young children who would play with the inmates as dad got his haircut. There were the anecdotal stories and old pictures testifying to the fact that guards, inmates and family members of prison workers decorated the prison for Christmas. And over the years, as in many prisons, inmates were known to put their own lives at jeopardy to save a guard’s life during times of disturbances. Apparently, the Quakers that helped to inspire the founding of EASTERN STATE may have been correct in their belief that “The Light” shines in everyone - sometimes it is just harder to see, especially from the darkest reaches of the human soul. 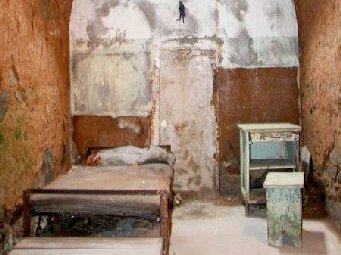 THE IDEA OF SOLITARY CONFINEMENT TOWARD THE GOAL OF REHABILITATION, ALTHOUGH SUPPORTED BY THE QUAKER SOCIETY OF FRIENDS, DID NOT ORIGINATE WITH THEM, NOR DID IT WORK PARTICULARLY WELL. MANY MISBEHAVIORS ARE THE RESULT OF MENTAL ILLNESS AND THE ISOLATION ONLY SERVED TO EXACERBATE ITS EFFECTS. 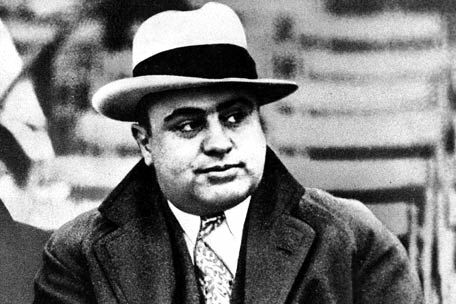 AL CAPONE'S FIRST INCARCERATION WAS IN EASTERN STATE. THE INFAMOUS GANGSTER WAS CONVICTED OF CARRYING A CONCEALED HANDGUN INTO A MOVIE THEATER. DESPITE HIS CRIMINAL NATURE, HIS CELEBRITY AFFORDED HIM COMFORTS THAT MOST OF THE INMATES WERE DENIED. ARCHAEOLOGIST JESSE SARNOFF (LEFT) AND THE AUTHOR (A FORMER CORRECTIONS OFFICIAL) DISCUSS THE HISTORY OF OUR PENAL SYSTEM. 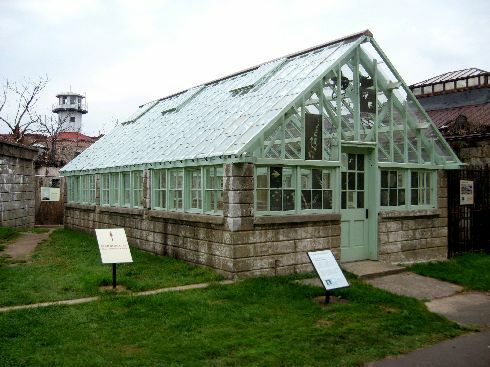 MUCH OF THE PRISON'S FOOD WAS GROWN ON PREMISE BY INMATES TRAINED IN AGRICULTURE AND GARDENING. 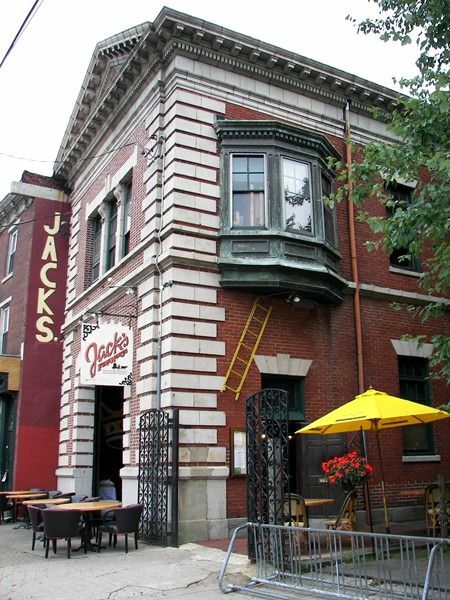 After our tour, we decided to view the prison from an entirely new perspective, so we headed over to Jack’s Firehouse, a unique tavern and eatery located directly across from EASTERN STATE. From my vantage point at the bar, I could view the massive front wall and entry gate. I thought about those men who were transported to this horrifying place by horse and wagon, doomed to spend a long time in the bowels of that hellish building. I further mused about the rather interesting juxtaposition that is occurring here. Just a short while ago I was discussing with our guide Jessie about the need for “body bars” inside EASTERN. 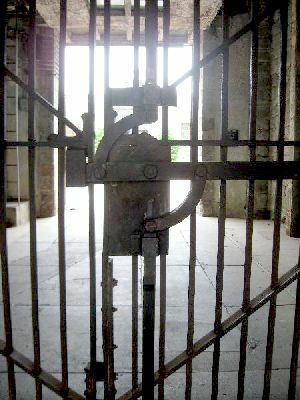 The metal grate-like protection over the lower flats of the wing that was used to protect against bodies being thrown off the tiers and potentially hitting guards and inmates who happened to be passing by down below. As the prison degenerated over the years into an overcrowded, antiquated and often violent place, the prison administration felt the need to implement these additional security measures. As I sit back on my comfortable stool, hoisting an exceptional offering from a local brewery, I come to appreciate the stark difference between the bars on this side of Fairmount Ave. as opposed to those on the other. 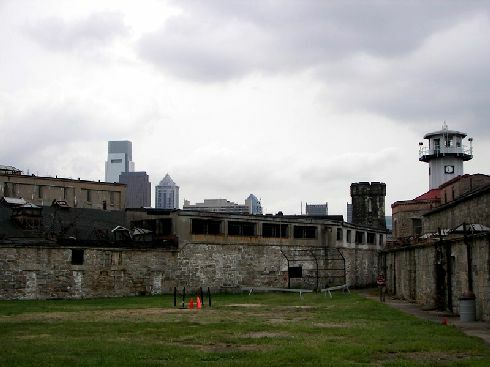 OVER THE YEARS, EASTERN STATE DEGENERATED INTO A CRAMMED AND VIOLENT PLACE. BODY BARS PROTECTED OTHER INMATES AND GUARDS BELOW FROM UNFORTUNATE PRISONERS WHO WERE THROWN FROM THE UPPER TIERS DURING ALTERCATIONS. The following week I would return to Jack’s. Across the street there was an abundance of abnormal and perhaps even paranormal activity afoot. The preparations for “Terror Behind the Walls,” the prison’s yearly haunted house spectacular were nearing completion. And at the same time, the cast and crew from Ghost Hunters, the extremely popular cable show, were rapping up production for an upcoming episode. 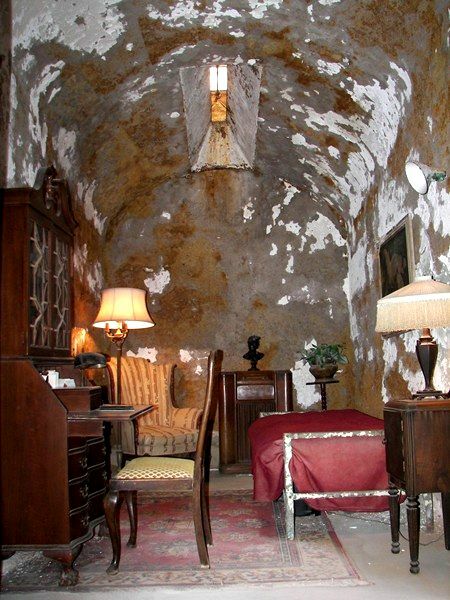 I have seen previous segments filmed at EASTERN STATE, and the evidence presented might convince event the most ardent skeptic. After all, this place has perpetuated a most unhappy history, replete with death, depravity and despair. By supernatural standards this piece of Philadelphia real estate should be a ghost hunter’s utopia. 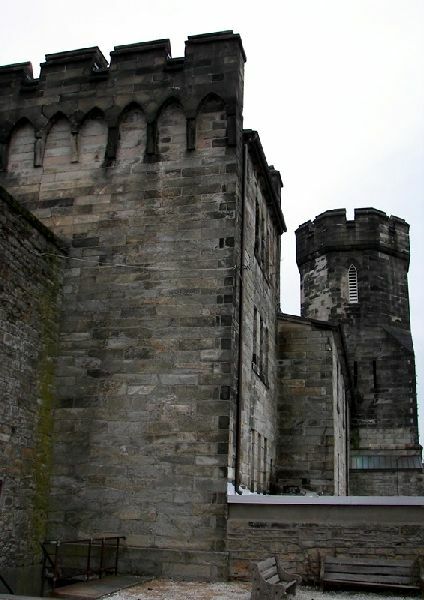 There are some profound ironies about EASTERN STATE PENITENTIARY. Haviland’s design has over time seems to have fulfilled the goal of providing a somewhat monastic atmosphere. There is an unsettling serenity behind these walls. During the Halloween season thousands will expend a good amount of time and energy in order to experience a substantial dose of terror within the confines of Eastern State. While for most of its history men employed every means possible in order to escape the terror of this place: bribery, weapons, tunnels, going over the wall and hostage taking. Once caught, the prisoners would do their time in “The Hole,” and then begin again the task of designing their deliverance from the dark side of enlightenment. THE FORMIDABLE CELL WALLS WHICH WERE SO EFFECTIVE AT KEEPING HUMAN BEINGS IN CAN NOT KEEP NATURE OUT. TREE ROOTS ADD TO THE EERIE EXHIBITION. 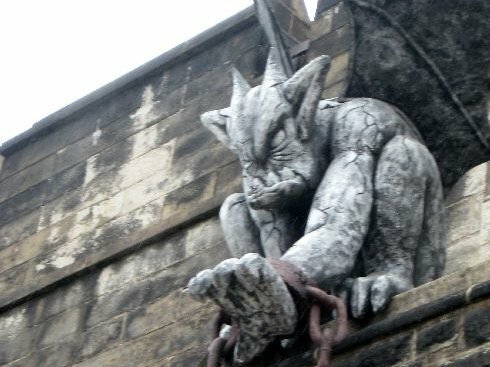 EVERY YEAR DURING THE HALLOWEEN SEASON, EASTERN STATE PUTS ON A NIGHTTIME "HAUNTED PRISON" SPECTACULAR INVOLVING ACTORS AND SPECIAL EFFECTS GALORE. THE SHOW IS EXTREMELY POPULAR AND HELPS TO FUND THE PENITENTIARY AS AN HISTORIC SITE. 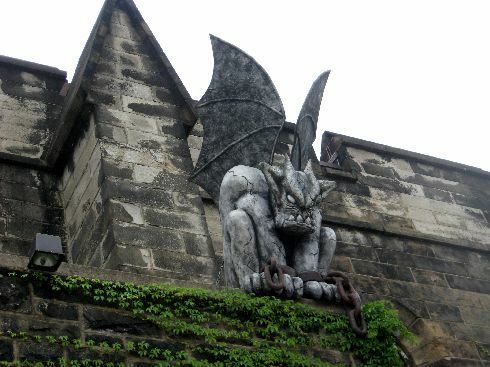 THESE GARGOYLES ARE PART OF THE STAGING PROPERTIES FOR THE EVENT. THAT'S FRANK ON THE LEFT WITH THE EXTENDED HAND AND HIS BUDDY ON THE RIGHT IS CARSON. WE ARE TOLD THEY ARE MADE OUT OF DENSE STYROFOAM. EASTERN STATE ALSO UNDERSTANDABLY ATTRACTS A NUMBER OF TRUE LIFE "GHOST HUNTERS," BOTH CREDENTIALED AND SELF DESCRIBED.